An invasive species is an animal or organism that is introduced to a non-native environment where it is expected to cause great harm to that eco-system and the inhabitants of that eco-system. This is a fitting description for Ballast Point Brewing and their opening of a Long Beach location in the middle of an area that is home to local and independently owned Beachwood Brewing. While it is likely that this would have been problematic even if Ballast Point were still owned and operated by the same people who started it over 20 years ago, it is all the more contentious since Ballast Point was acquired by Constellation Brands (owners of Corona) a little over a year ago. When the plans for opening were first announced, it could only be interpreted as shots fired by Big Beer against small, independent local breweries. Instead of cowering in the shadows or simply ignoring the threat against them, Beachwood took action. On July 29, 2016 they adopted the hashtag #independentbeer, they marked the day as one to unify and stand-up to corporate beer and their attempts to bully the smaller, local breweries who were clearly their targets. Next up in their acts of independence was a bold yet simple idea; a growler exchange program. Bring in your corporately owned brewery growler (i.e. Ballast Point and a few others) and have it swapped out for free with a brand new Beachwood growler and a $5 gift card. Essentially paying the consumer to ditch their big beer gear and support local and independent. , habanero and most importantly a grapefruit variant. This series was titled “Invasive Species” and features the logo of a dead fish and the bold words of “It matters who makes your beer” and a new hashtag #truetobeer. As a staunch supporter of the independent beer movement, this release was too good to pass up. Now, as a consumer, I’ve not purchased or drank a Ballast Point beer in over a year, so my recollection of those initial offerings might be fuzzy. With that said, I must also disclose that my palate happily agrees with just about all the beers that Beachwood is currently brewing. So how were the beers? They were all winners. The Beachwood take on these four staples of the Ballast Point lineup were, in my opinion, superior to those of the original. The Habanero had a lingering pepper flavor that did not burn, yet allowed for natural beer flavors to shine. The Mango was subtle, not overly sweet like the Ballast version I remember. The grapefruit was masterfully recreated and it avoided overloading the palate with fruit flavor. And the standard IPA? Another masterstroke as it might have been the best version of Sculpin I have had in many years and served as a reminder of what put Southern California on the beers map in the first place. While it is not yet known if Beachwood will continue to brew these four reinterpretations, I tend to think that these are the beers that might just make the average, non-informed consumer pay a little more attention to where their beer is coming from and just how good it can be when you strip away the billions of dollars and have quality people focused on making quality beer for all to enjoy. Long live Beachwood Brewing and long live Independent Beer! Tags: Ballast Point, beachwood brewing, corporate beer, Craft Beer, drink local, independent beer, Indie beer, IPA, long beach, sculpin, truetobeer | Permalink. 2016 has been something a weird year for me in the world of craft beer. I have never had to defend my own personal opinions from other beer drinkers in the way that I have had to do since January when the usage of the term “indie beer” got exposure on a quasi-national level. It marked something of a turning point for me as I realized that the craft beer world was not quite not the shiny, happy place that I had turned it into in my mind. In short my love affair was under something of a strain. So leave it to Societe Brewing to host an event that not only delivers the goods on every level but helps to rekindle the fires of my passion for this elixir that I love so much. Societe Brewing has been one of my favorite breweries since they opened their doors four years ago. Honestly, Societe is probably my personal favorite but the thought of trying to rank breweries in San Diego is not only daunting but counterproductive to the harmony and unity between breweries in the area. Those ideas of harmony and a collaborative spirit between breweries was proudly on display at Societe’s fourth anniversary party this past Saturday, known simply as Societe IV. Part of the fun with anniversary parties at Societe has been that every year is something new and they are continually raising the bar. This year will be a hard one to beat. Incorporating an Olympics theme, complete with a torch and a parade of the “Ale-thletes” to start the event, Societe invited nearly two dozen breweries (and one-man team Nate Soroko) from all over San Diego and one from Northern California to compete in a variety of brewers games, including a washer toss tournament, grain stacking challenge, tri-clamp challenge, Beer Chugging, Stein Holding and even an impressive barrel throwing event, which for those who are not sure, a barrel weighs right around 90 pounds and is not the easiest thing to throw for distance, but was a sight to behold. The spirit of camaraderie and friendship were on display for all to see and take part in and the fun that these folks were having was simply infectious as it was impossible to find someone not having a great time. As fun as all the games were to watch and enjoy rooting for your favorite local brewers, we also came for the beers. I found several new treats to savor while enjoying all the festivities the day had to offer. New variations of The Bachelor, their single hop IPA series, included Nugget, Calypso and Idaho 7 while The Bachelorette, their single hop lager, introduced the Sterling varietal. To round out the new beers was the first Societe witbier, The Filly. Suffice to say everything was incredibly enjoyable and of the highest quality. What came as perhaps the biggest surprise of the entire day, and announced only a few hours before the event, was the opportunity to purchase their very first bottled beer, a feral ale called The Swindler. As someone who was lucky enough to have this beer during the Societe 3 event last year, I can attest to its absolute incredibleness. At four years in Societe is continuing to showcase not only their excellence at brewing but at displaying the strong sense of community between an incredible number of local San Diego breweries. In a lot of ways I was filled with a great deal of pride, even if my connection to the brewing industry is tangential at best, the event left me invigorated and rejuvenated. So cheers to Societe and all the Ale-thletes, I hope this one becomes a tradition, but even if it doesn’t, I will still be there to give all the support I can. Tags: Brewer's games, Craft Beer, drink local, Indie beer, IPA, San Diego, San Diego beer, sdbeer, Societe Anniversary, Societe Brewing, Societe IV | Permalink. Released today by the Brewers Association, this information provides a valuable look at how the sales of craft beer are impacting the market as more and more local breweries make a name for themselves on a national level. 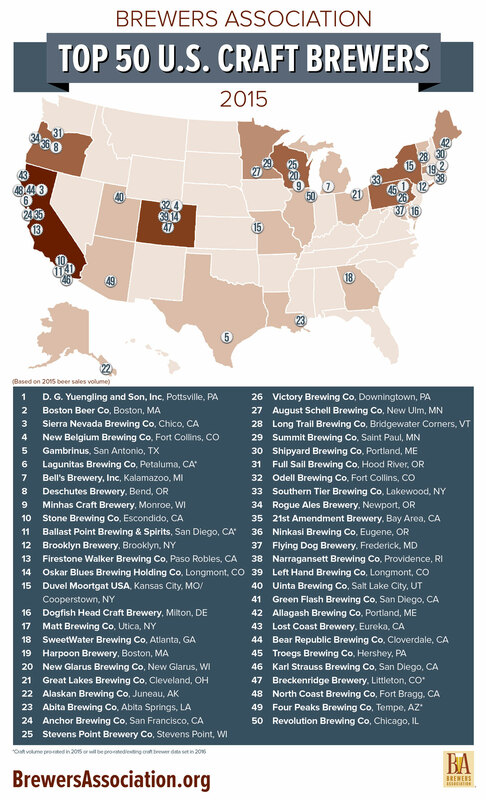 It is also hard to look at this list and not notice the breweries who will be left off of it this time next year when the are removed due to their acquisition by larger macro breweries. Still, the silver lining is that the market for quality craft beer made by local, independent brewers continues to grow and that should be applauded, well done to the men and women who are making great beer to be enjoyed by all. The Association’s full 2015 industry analysis, which shows regional trends and sales by individual breweries, will be published in the May/June issue of The New Brewer, available in May 2016. 1 Figure based on companies that met craft brewer definition for all or part of 2015. An American craft brewer is small, independent and traditional. Small: Annual production of 6 million barrels of beer or less (approximately 3 percent of U.S. annual sales). Beer production is attributed to the rules of alternating proprietorships. Independent: Less than 25 percent of the craft brewery is owned or controlled (or equivalent economic interest) by an alcoholic beverage industry member that is not itself a craft brewer. Traditional:A brewer that has a majority of its total beverage alcohol volume in beers whose flavor derives from traditional or innovative brewing ingredients and their fermentation. Flavored malt beverages (FMBs) are not considered beers. Tags: brewers association, Craft Beer, Indie beer, local beer, sdbeer, top 50 | Permalink. At the end of 2015 big beer made a barrage of acquisitions in an effort to expand its portfolio of “craft” Brewers. The moves were significant, and showed that corporate beer is not planning to sit back and let its share of the market be reduced any longer. On the local front San Diego felt the sting of losing two of its own local breweries as Saint Archer was purchased by Miller/Coors, and more devastatingly, Ballast Point selling for 1 Billion dollars to Constellation Brands i.e. Corona. Now with the news that 10 Barrel Brewing, a property of InBev that masquerades as still being a local, independent brewery based out of Bend, Oregon, will be opening a location in downtown San Diego’s East Village neighborhood it has become clear that big beer is no longer content to simply buy the competition. They want to bury it. 10 Barrel sold to InBev in November of 2014. Since then big beer has made a concerted effort to aquire at least one indie Brewer in every major market of the western United States. They purchased Elysian in Seattle, Golden Road in Los Angeles, Saint Archer and Ballast Point here in San Diego, Four Peaks in Phoenix and Breckenridge Brewing in Colorado. By placing a brewpub in San Diego, InBev has shown that it will continue to rely on deception and outright lies to attempt to create a ruse to confuse and trick customers. It is shameful. This is an effort to severely damage the indie beer culture of San Diego and we cannot sit back and take it. One of the many rewarding aspects of loving the local, independent beer scene of San Diego is the knowledge that your money is staying in San Diego and supporting small business. Your money is helping your neighbors, and not lineing the pockets of rich people who do not give a damn about the community of San Diego. They see our city as dollars signs. They know their product does not stand a chance when lined up against the world class beers brewed by many of our local, indie Brewers. Deception is the new strategy. Recently on a trip to Portland, Oregon I spent a Saturday night hopping from brewpub to brewpub in the downtown area. After a few hours I stumbled upon the 10 Barrel location; it was packed. I was shocked. Portlanders are known for their being savvy when it comes to supporting local business over corporate greed. It opened my eyes to a few truths that I still wrestle with but two of those truths are that not only are InBev’s deceptions working, they are working very well even in a indie beer town like Portland. The most dangerous weapon we possess in the revolution against big beer is a knowledgable consumer. It is now more important than ever that we, as consumers, take the time to learn who owns who and where our hard earned money is going. Big beer is betting that we are too lazy to bother with seeking out the truth. It is time to teach how wrong they are. One of the most interesting details of the proposed location for the corporate beer sell out is the proposed location; just a block away from local favorite and Great American Beer Festival gold medal winning Monkey Paw Brewing and Pub. While I do not know their reactions to the news, I do know this: Monkey Paw Owner Scot Blair and Head Brewer Cosimo Sorrentino are two of the best the San Diego independent beer community could hope to have on the front lines for this battle. These are two people that I will always have the backs of and the San Diego indie beer community will be right there with me. InBev just brought a knife to a gunfight. Tags: 10 barrel, big beer, cosimo sorrentino, Craft Beer, drink local, independent beer, Indie beer, IPA, Monkey Paw, San Diego beer, scot blair, sd beer | Permalink.